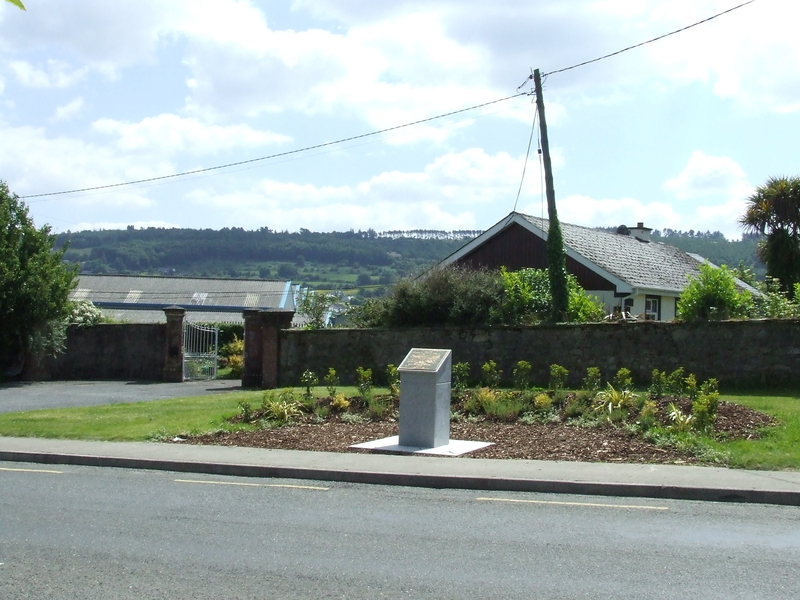 A recent post brought you news of the unveiling of a memorial in Carrick-On-Suir, Co. Tipperary to Captain John Lonergan who won the Medal of Honor at Gettysburg. A follow-up visit has allowed some photos of the memorial to be posted and also provides a backdrop for a more detailed look at Lonergan’s actions in this momentous battle. John Lonergan was born in 1837 at Sir John’s Road, Carrick-On-Suir, Co. Tipperary. 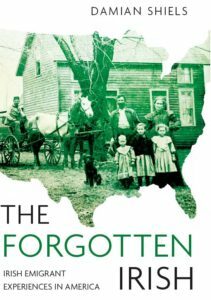 His family emigrated to the United States in 1848 where he was active in the Fenian movement both prior to and following the Civil War. 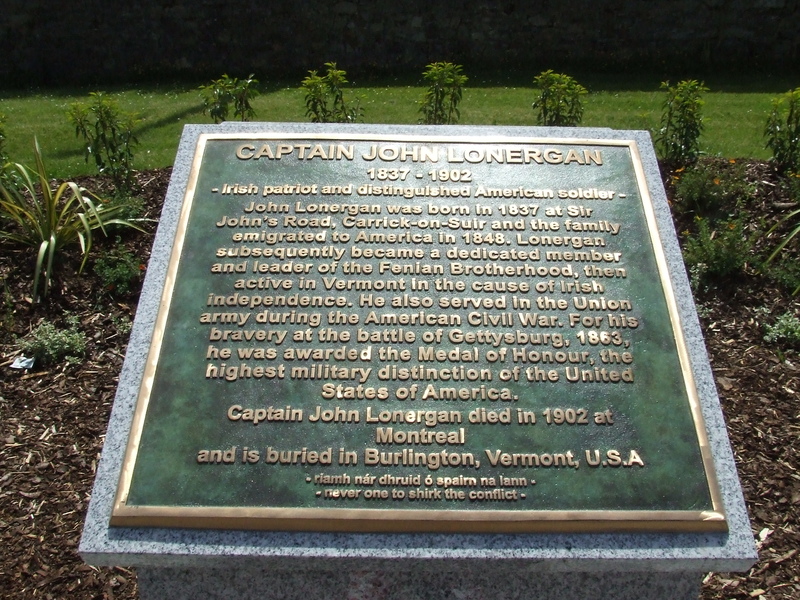 Lonergan became a Captain of Company A, 13th Vermont Regiment, a nine-month unit that was organised in October 1862. They spent much of their service on guard duty but joined the main body of the Army of the Potomac in time for its greatest battle at Gettysburg, Pennsylvania in July 1863. The 13th Vermont arrived at the battlefield on the evening of the first day (July 1st) as part of Brigadier-General Stannard’s 3rd Brigade (2nd Vermont Brigade) of Major-General Abner Doubleday’s 3rd Division. They were part of Major-General Reynolds I Corps. The 13th Vermont’s first major action of the battle took place on the second day (July 2nd), when the regiment were positioned in support of artillery at Cemetery Hill. While stationed here they received an urgent request to rescue a Federal Battery in General Hancock’s section of the line that had been abandoned and was about to be taken by the Confederates. The Vermont men counterattacked and drove the enemy back, in the process recapturing the guns. Having accomplished this the 13th Vermont and Captain John Lonergan’s Company A continued their advance and charged as far as the Emmittsburg Road, where two Confederate artillery pieces were captured. Not content with this, Lonergan and his men then surrounded the Roger’s House which contained a large number of Confederate troops, and forced them to surrender. Despite the heavy fighting that they experienced the 13th Vermont’s role in the battle was not over, as they were to play an important part in the repulse of the Confederate advance on the final day (July 3rd), which has gone down in history as ‘Pickett’s Charge’. The 13th Vermont had arrived at Gettysburg with a strength of some 636 men. They were to lose 10 men killed, 103 wounded and 10 missing (a percentage loss of 19%) during the course of the fighting (Bicheno 2001). Following the battle John Lonergan’s pivotal role in the 13th Vermont’s success on Gettysburg’s second day was acknowledged, as he was the recipient of the Medal of Honor for his actions. The citation indicated that the award was presented as a result of Lonergan’s gallantry in the recapture of four guns, as well as the capture of two additional enemy guns and a number of prisoners. 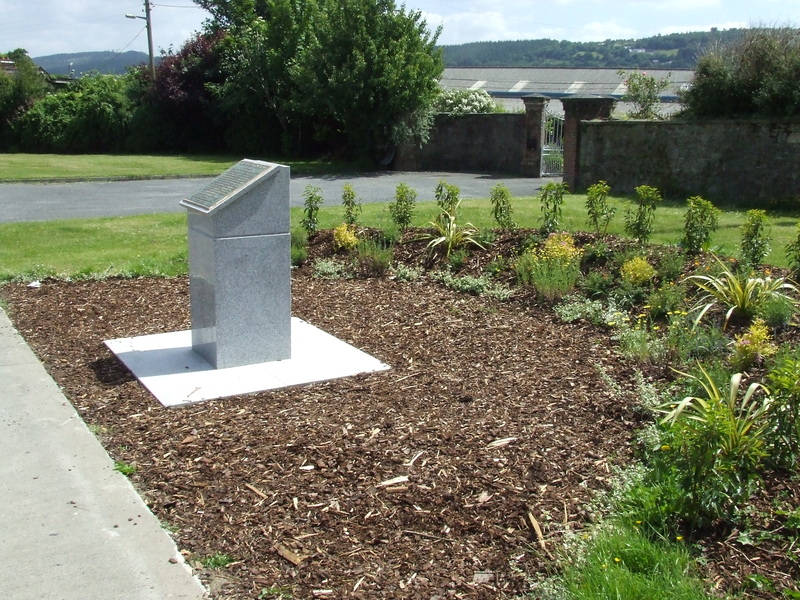 The memorial on the street where he was born in Carrick-On-Suir was officially unveiled on May 8th last. It is in a prominent position on one of the main routes into the town, and is a fitting tribute to the Tipperary native. Thanks for this- I wonder was your g-grandfather fortunate to miss out on that position give the dangers associated! I must say you have really opened my eyes over the past few months to the real wealth of Irish diaspora history in Vermont, it is remarkable. I am not sure- Peter do you have access to that information? Yes, He was a Wexfordman I think I narrowed it to the parish as well but cant recall it off hand.